A deadlock, also referred to as a deadbolt, is a locking mechanism distinct from a spring bolt lock, as a deadlock cannot be moved to the open position except by rotating the lock cylinder. Therefore, a deadlock makes a door more resistant to entry without the correct key. Deadlocks are ideal as a second lock on a door where a standard lock is already installed. Most deadlocks are designed to a quality standard to ensure they pass all the tests to be secure enough. Many insurance companies now demand that only deadlocks which meet standards will be covered. Typically, deadlocks have a hardened steel security bolt which is fitted inside the door and when locked it inserts into a secure point in the door frame. This secure point, called a strike box, can be strengthened for further security using a hardened steel plate. These locks are extremely effective as the first line of defense against burglary. Deadlocks are manufactured in a variety of finishes and come in various designs to match the type and weight of your door. For exterior doors, you should consider using a 5 lever deadlock and for interior doors a three lever deadlock. 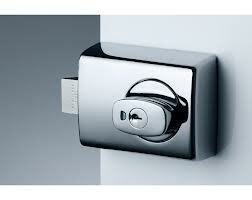 (The difference between 3 lever and 5 lever deadlocks is that the inside of the locks are cut at different depths. Generally, the lock bolt will turn the levers up and down with the turn of the key. The moving levers will then operate the lock system). If a deadlock is cylinder operated, it can either be single or double cylinder. If you are using a single cylinder deadlock, it will accept a key on one side of the lock, but is operated by a twist knob on the other side of the door. A double cylinder lock will accept a key on both sides and therefore do not require any twist knob on either side of the door. This prevents unwanted unlocking of the door by forced access to the interior twist knob (should the door be close to a window for example). Some locks also have a lockable knob (A key is always needed on one side – usually external, and a twist knob can be used on the other –internally, unless a button has been pressed).